"In this story about being true to oneself, a boy searches for the secret to doing the perfect bomb into the water. With training from Nan, an expert and former champion, and by listening to his own voice, he finds his unique style and pulls off a wonderful, acrobatic, truly awe-... read full description below. 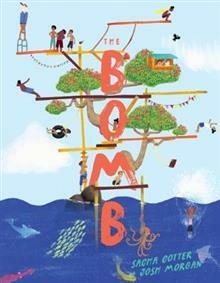 "In this story about being true to oneself, a boy searches for the secret to doing the perfect bomb into the water. With training from Nan, an expert and former champion, and by listening to his own voice, he finds his unique style and pulls off a wonderful, acrobatic, truly awe-inspiring bomb"--Publisher information. Sacha Cotter is a writer, librarian and teacher. Josh Morgan (Te Aitanga-a-Mahaki, Rongowhakaata) is an illustrator, writer and designer. Sacha and Josh have previously collaborated on two picture books: Keys/Nga Ki and The Marble Maker/Te Kaihanga Mapere. Keys was a finalist in the picture book category and Nga Ki was winner of the Maori Language Award of the New Zealand Book Awards for Children and Young Adults 2015. Nga Ki also won Te Tohu Taurapa Award in the LIANZA Children's Book Awards 2015 and was selected or the IBBY Honour List in 2016. Te Kaihanga Mapere won Te Kura Pounamu award of the New Zealand Book Awards for Children and Young Adults 2017.